When Jon Katz got a call from an animal control officer about Simon, a neglected donkey who had been found on a failing farm in upstate New York, he wasn't expecting to add another animal to his already full life. But when he made the trek out to meet him, he couldn't help falling in love with the skinny, mangy donkey who had already suffered so much, and he ended up taking him into his home. It was Simon who listened in the fields as Jon read to him and discussed philosophy. And it was Simon who forced Jon to confront the most difficult parts of life. And ultimately, it was Simon who brought Jon to a new understanding about mercy and compassion. 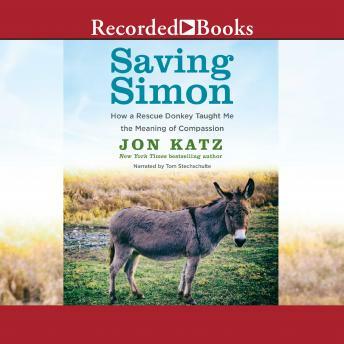 In this heartwarming and heartrending memoir, Jon Katz plumbs the depths of the human-animal bond with his trademark grace, strength and skill. Jon Katz has written twenty-six books, including works of nonfiction, novels, short stories, and books for children. He has written for The New York Times, The Wall Street Journal, Slate, Rolling Stone, and the AKC Gazette, and has worked for CBS News, The Boston Globe, The Washington Post, and The Philadelphia Inquirer; he is also a photographer. He lives on Bedlam Farm, in upstate New York, with his wife, the artist Maria Wulf, and their dogs, donkeys, barn cats, sheep, and chickens.